I was going to post the inside of my card also, but it turned out pink, yuk, even though I took it just a few seconds after this photo with the same lighting. Oh well, I wouldn't have put these colors together myself, but the gals at Color Throwdown have. It's a lot more turquoise in person and I think it turned out kind of cute because on the inside I put, Birds of a Feather Flock Together for a Happy Birthday! Supplies: Card Blank 5" X 7" White Value Pack Wal Mart, papers from my paper stash, Ink: Ranger Archival Ink-Jet Black, Stamps: Impression Obsession-3107-XL Heartlines, Clearly Wordsworth-V026 Tiny Wise Words, Cuttlebug Embossing Folder-Heart Blocks, Coluzzle-Circle, Stampin Up-Word Window punch, LePlumeII markers-salvia blue, rose pink, aqua grey, daffodil yellow, dusty pink, pale pink, bubblegum pink, wisteria, Stampin Up marker-ruby red, CTMH markers-citrus leaf, sweet leaf, baby pink, bubblegum, blush, watermelon, sunflower, creme brulee, sunny yellow, ocean, pop dots. Very cute, Beverly! Thanks for playing this week! I love the images you've used! So sweet and so cute!!! Thanks for joining us at Crafty Creations Challenge!! What a sweet card! Love those tiny hearts and birds! Thanks for playing with us! Really really cute!! Perfect inside sentiment!! 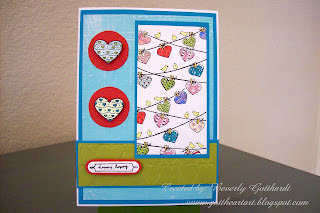 Thanks for playing the Crafty Creations Challenge!! cute card! Lvoe the colors. Thanks for joining us on CCC this week.